Things you should know about Custom CNC Milling Services. CNC milling is one of the most popular CNC machining processes. Milling incorporates the technical aspects of both drilling and cutting processes; CNC milling uses a rotating cylindrical cutting tool just like in drilling. But, unlike the single axis motion of the latter, the cutter and workpiece in a milling machine can move along three, four and even five axes allowing it to produce shapes, holes and slots with tight tolerances. In addition, the workpiece is often moved across the milling tool in different directions, unlike the single axis motion of a drill. However, multi-axis functionality isn’t the only unique thing about Custom CNC milling. In this article, we will be exploring some of the major/minor facets of the machining type including main components, CNC mill types, advantages with CNC milling and more. Let’s first familiarize ourselves with the critical components that comprise a CNC Milling machine. 1. Control panel: Control panel is the brain of a CNC milling machine. The machinist/controller feeds the G-code (required dimensions) using the keyboard which, in turn, instructs the axis motors to move the cutters and other components. 2. Table: The table is used to hold the workpiece stationary for the entirety of the milling process. The workpiece is fit to the metal/wooden/plastic table using T-slots and metal clamps. 3. Column: The columns run along the axis to give a backbone to the milling part. 4. 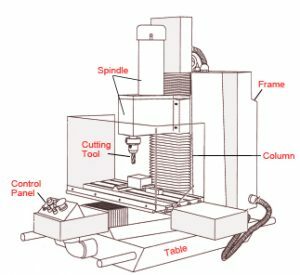 Cutting tool: A cutting CNC machine tool is attached to the column. It moves across the axis to give the desired shape to the CNC machined parts. 5. Frame: As the name suggests, the frame gives sturdy support to the machine, providing them with maximum rigidity to withstand cutting forces. It is mainly built using cast iron. 6. Axes: The axes in a CNC milling machine allows cutting tool/workpiece to move around obtain the maximum possible precision. 7. Spindle: The spindle consists of a rotating assembly that holds the cutting tool and a motor that runs the entire workpiece. 8. Coolant supply tube: The coolant supply tubes are used to cool down the rapidly heating metal workpiece and to lubricate the cutting tool for smooth movement. There are two types of CNC milling machines available with respect to its working- Vertical and Horizontal- with the major difference being in their spindle placement. Vertical CNC milling machines have a vertical spindle axis. In this machine type, the cutters are placed vertically in the spindle and are able to make drilling or plunge cuts. Popular examples of Vertical CNC mills include Bed mills and Turret mills. In horizontal CNC milling machines, the cutters are placed horizontally on an arbor. Here are a few features of a CNC Milling machine that makes it an ace in the CNC manufacturing industry. 1. 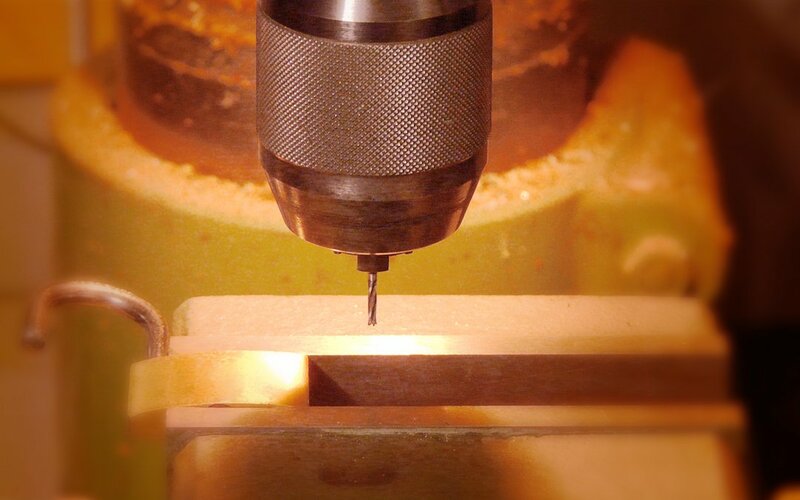 Safety– Custom CNC Milling process is about 10x faster and safer than traditional milling machines’. With computer systems handling everything, there is minimal contact between the machines and the operators. The operator feeds in the codes and the machine is directed to produce custom machined parts with tight tolerances. The manual work is reduced by a multifold and the chances of human error is next to nothing. 2. Accuracy – CNC milling machines are notorious for producing guaranteed accuracy all thanks to its next-gen features and innovative working. Tight tolerances are no big deal with CNC milling machines. 3. Versatility – CNC milling machines are not limited to producing machined parts out of one material type. From metals to industrial plastics and alloys, almost every material type can be used with a CNC milling machine that too without compromising on the quality front. 4. Lower Overhead Costs – With a severely automated process in place with CNC milling machines, you save a huge chunk of machining and manufacturing costs which you can use in any other development facet. Here at Machining Design Associated Ltd., we offer top of the line CNC milling services to businesses across all industry verticals. For more information, drop us an email at machiningdesign@mdaltd.ca or fill up the form here.